Now I’m no Millionaire, but I have been in a modern Bentley, and must say there are striking similarities between Bentley interiors (at least the tan leather/ wood combinations) and these Pilot Somes Pen boxes. And of course, at a fraction of the price…luxury you can afford. 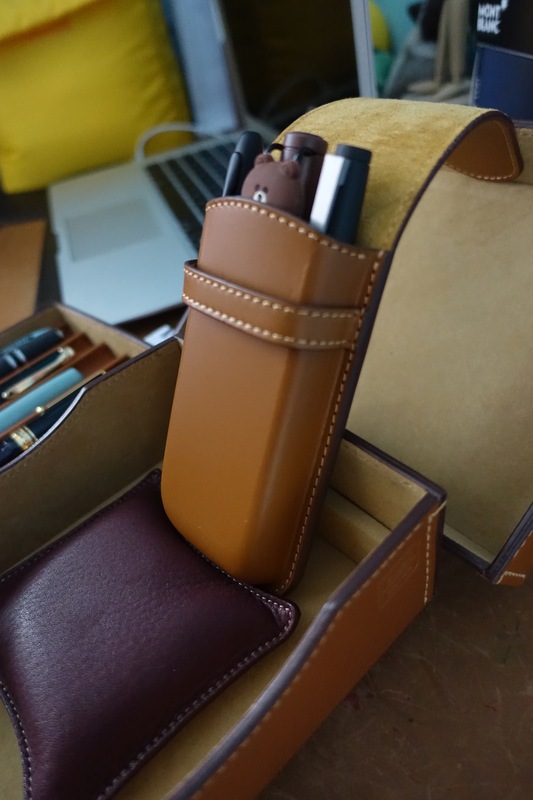 I came across Pilot Somes leather pen cases from a review on You Tube. I since saw a written review on the fountain pen forums. Apparently Somes is a saddle- making company based in Hokkaido, Northern Japan. From what I understand of Hokkaido the population is small and there is an amazing amount of flaura and fauna, as well as many wild horses. A vast natural landscape not visited much by outsiders. Even the Japanese tend only to visit during the ski- ing season. If I ever go back to Japan, I would love to visit Hokkaido. 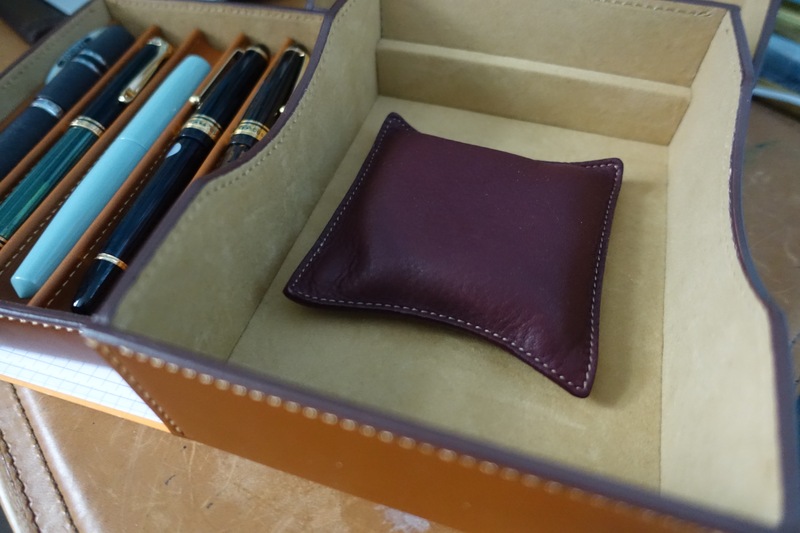 Somes teamed- up with Pilot to make a range of leather pen cases from 1,2,3 pen fold- over cases, to a 3-pen mini- folio- type case, and their most impressive item…the 5 pen box below. The box is actually very light- even filled with your most executive- level pens. The detailing is immaculate, and the lid isn’t very tight on the base- which makes it easy to retrieve your pens one- handed with minimum fuss. Very handy when you have papers and un- capped ink bottles all around. They think of everything in Japan. The item is immaculately packaged and presented in a heavy black cardboard box with gold lettering. Very executive- level pen collector. 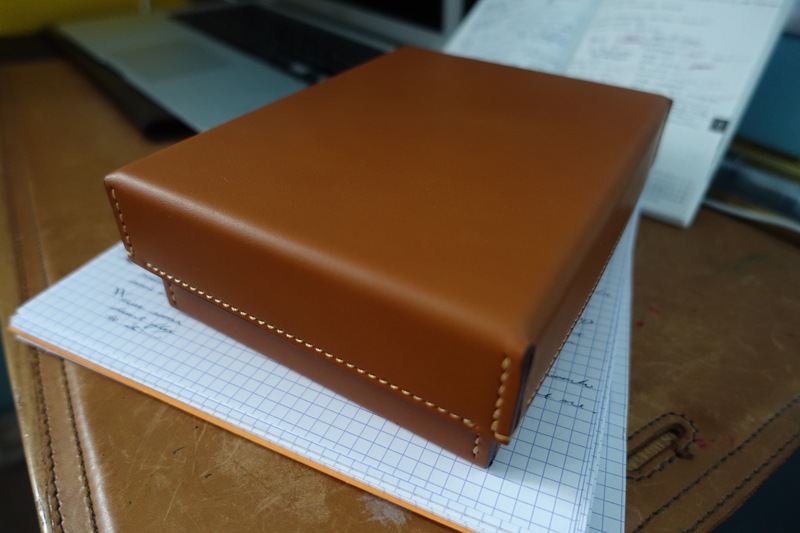 The box is lined with a soft suede lining and comprises of three separate leather open boxes. One box acts as the lid- the other two form a second chamber underneath the main pen dividers. You could store more pens here, or cartridges, ink cloth etc. Here is is housing my Nagasawa palm rest/ pen rest. The interior of the box is lined with this nice soft suede. Underside of the lid- soft suede material. 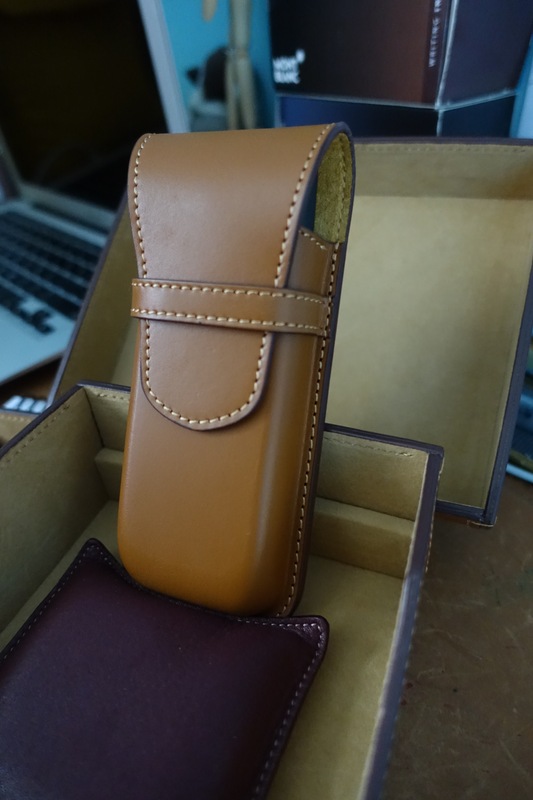 Here is the Pilot Somes 3-pen case I ordered with it.